Whether you are always looking for ways to be kinder to the environment, like to use eco-friendly, natural products and avoid your exposure to chemicals, or are keen to cut costs, it’s a good idea to think about using green cleaning items in your home. Handily, while you can buy good options from the shops these days, many of the ingredients you’ll need to make your own natural cleaners are probably already sitting in your pantry, anyhow. To help you get a sparkling kitchen, bathroom and other areas ASAP, read on for some top tips for cleaning your home naturally. 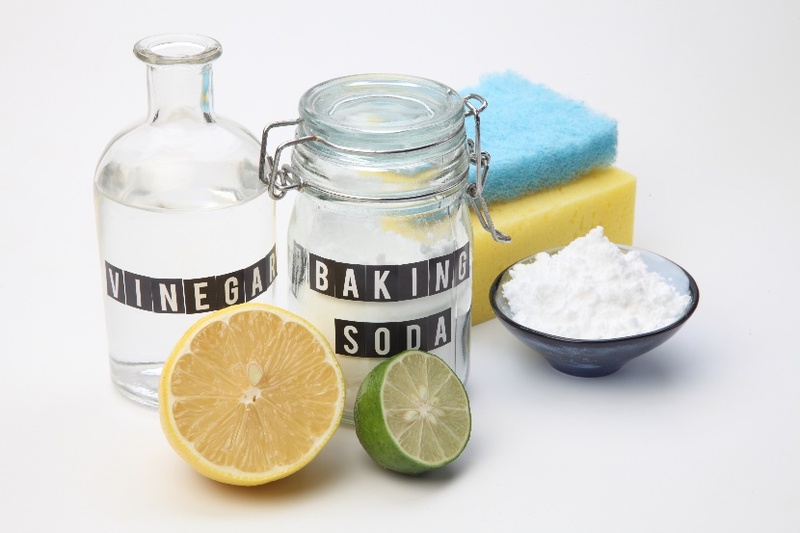 One of the best natural cleaning products you’ll find is baking soda (a.k.a. sodium bicarbonate). An odor absorber and therefore natural deodorizer, baking soda is also slightly abrasive, which makes it a good choice for scouring. It works best on grease, proteins, animal messes and the like. Use it by sprinkling it onto the area you want to clean and then scrub with a damp cloth. 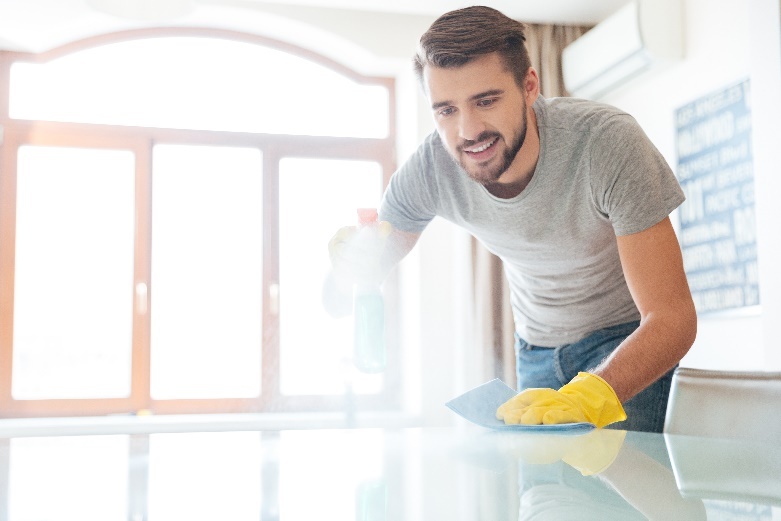 When you need some more cleaning power for harder-to-move stains, combine baking soda with vinegar for an effervescent effect. You can also add water to baking soda to create a cleaning paste. There is a wide variety of things you can clean with baking soda (and other ingredients as required). For example, use it to clean stove burner grates, ovens, garage floors and other concrete areas, scuffed walls, stained cups and mugs, grills and barbecue utensils, garden tools, upholstered furniture and more. Distilled white vinegar is an acidic wonder that works effectively on alkaline substances. It will help to dissolve scale, tarnish, and mineral deposits; cut soap scum and wax buildup; inhibit mold, mildew and some bacteria; and get rid of stains such as those caused by rust, coffee, tea and so on. Use it in water as a natural cleaning tool, adding in a drop or two of essential oil to diffuse the vinegar odor if you’re not a fan. If there’s heavy buildup, it pays to soak a cloth in vinegar and lay it over the affected area for an hour or so to let it really soak in. After that time, start scrubbing. Take advantage of the power of vinegar to clean and disinfect your dishwasher, drains, floors, steam iron, and showerheads, and use it to get things like glassware, coffeemakers, moldy walls, and windows squeaky clean. Lemon is a wonderful natural cleaner not just because it gives your home a lovely fresh scent and is pleasant to work with, but because it also happens to make a very effective cleaner, especially when it is combined with one of the other products mentioned above or below. The acid in lemon juice helps to remove a wide variety of dirt, stains, deposits, scum and other build-up. You can cut lemons in half and use the wedges in cleaning, or use lemon juice in sprays and other mixes. Sometimes you’ll need to let the lemon sit on an area for up to half an hour or so to really work its magic, but other times it will be effective ASAP. When you need to do some garbage disposal cleaning, lemon comes in handy as it’s a natural deodorizer. Grind up the peels in your disposal unit, along with some running water, to refresh things in a hurry. Lemon can also be used for soap scum in kitchens and bathrooms, hard-water deposits on glassware, countertops (though avoid using it on marble and other delicate stone as it can sometimes cause discoloration), cupboards, appliances, food stains, rust, cutting boards, faucets, grout, dishes, and even laundry. Salt is another great natural cleaning tool that many people don’t realize they could be utilizing more. A real powerhouse because of its abrasive nature, salt is perfectly suited to scouring, whether you use it by itself, with lemon (a combination great for cleaning copper), or as a paste with vinegar. You can use table salt, kosher salt or sea salt, but table salt is obviously the most wallet-friendly option. Use salt in your home to scrub away grime on stove grates and oven racks, and to get rid of hard-water stains on glassware. It’s also great for cleaning greasy pots and pans, stained cups and mugs, wooden tables and countertops, and artificial flowers. Utilize some of the natural cleaning items listed here and you will soon have a home that is sparkling clean, smelling fresh, and free from nasty germs. You don’t have to put yourself, your family, your pets, the environment or even your budget at risk to do so, either.